The pink ones are plain, the yellow (which I should have added more colour too) are lemon flavoured and the chocolate ones are, well, chocolate of course! These 6 are thinly covered in marzipan for a smoother finish. I know I have blogged these before but I wanted to try them again doing more or less everything from scratch. Last time I used a cake mix and ready rolled fondant, they tasted great but the fondant wasn't right, too soft as I didn't use a 'pourable' fondant. I wanted to completely make my own but the recipe I wanted to use requires a candy thermometer which I am having trouble finding. So for these I made my own cake, kept the buttercream and jam the same but bought a box of fondant icing sugar that you add water to until 'pourable' with whatever flavours and colours you like. They turned out very good, the cake for some reason came out quite dark, it looks like I used wholemeal flour but I assured you I didn't - still tastes good. For some of the fancies I covered in very thinly rolled out marzipan, then poured the fondant over just to get a smoother finish (plus the marzipan tasted great in these, sort of french fancies meet battenburg!) For the rest I just poured the fondant straight over the icing blob and cake, these ones got a crisper fondant which is more accurate but don't look as pretty. Makes about 20 fancies depending on how you cut them. Preheat oven to 180C and line an 11 x 7.5 x 1" jelly roll pan with baking paper - set aside. Combine the cyder vinegar and rice milk and set aside to get a little curdly. Beat together the margarine and sugar then add the oil and vanilla and beat well. In another bowl add all the dry ingredients and set aside. Alternately add the dry ingredients and the milk into the margarine mixture, stirring well after each addition but be careful not to overmix. Pour into the prepared pan and bake for about 18 - 20 minutes or until golden all over and feels firm to touch. Let cool fully in pan then carefully turn out and remove the paper. Cut the cake slab in half, spread raspberry jam over one side then place the other half on top. Cut this into squares, however many or size you want. Prepare the buttercream by simply whisking all the ingredients together until smooth, it will be slightly stiffer than the recipe for cupcakes as you want it to hold it's shape when the fondant goes on. Place frosting into a piping bag with a large straight circle tip and pipe little blobs on top of each cake. My previous post on these has step by step photos here . Now, if you are going to add marzipan, I just very thinly rolled out some marzipan and placed over the whole cake, adding some more jam to the outside edges to help it stick. Also make sure you dust your surface and rolling pin with some icing sugar as it can be sticky. If you are not going to add it, some almond extract added to the pink fondant is very nice. For the fondant I mixed 125g fondant icing sugar with about 2 Tbsp hot water for each colour. The pink ones had some red food colouring added, the yellow ones had yellow colour and fresh lemon juice and the chocolate had 1/2 Tbsp cocoa powder and 1/16 vanilla extract added. Add more hot water or fondant icing sugar to get a spoonable, fairly thick frosting. Then, it's pretty messy, because of the icing blob on top I couldn't really dip these so I placed them on some baking paper and spooned over the fondant, making sure all the sides got covered. With some as I had the fondant too thin I had to cover 2 -3 times. When they are uniformly covered carefully lift off the paper with a butter knife and place on a plate and refrigerate until fully set. The squiggles on top are more buttercream thinned out for the pink ones and just melted dark chocolate for the yellow and chocolate ones. I definitely prefer this fondant to the last one, but strangely enough prefer the cake mix of last time to this one. I think all the chemicals in it make it more like the Mr. Kipling ones...oh the shame.... Anyway, they are very good and so cute - great for presenting if you have guests over. That is so cool you got to buy cakes from a horse-drawn cart!! My background is partly Scottish, grandparents came from Dundee and Glasgow, so love hearing things like that! Just made these to take into work tomorrow. (although i made them non-vegan, but sort of based off your recipe). These look absolutely amazing! 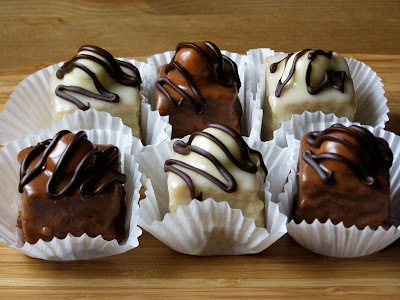 I have been having a serious French Fancies craving recently and am considering making this as a treat for Christmas. But I must ask - what Victoria Sponge box mix, that you used in your first try, did you find that was vegan friendly?! Every one I have found has either milk, egg or both in! Wheat Flour,Sugar ,Vegetable Oil ,Dextrose , Raising Agents (Glucono-Delta-Lactone, Sodium Bicarbonate) ,Cornflour ,Salt ,Natural Flavouring. The only thing I questioned initially was the 'glucono-delta-lactone' as 'lactone' didn't sound very vegan. Turns out it is not milk based at all but is a raising agent and most do consider it vegan, it can come from honey or red wine however, so if it's honey derived obviously it won't be ok. Personally, I was fine with this and have used the mix often, but it's up to you. I do like how the cakes turn out with it, I just omit the egg and used sparkling water until it was the right consistency. Hope they work out for you - we all found them better than Mr. Kipling's! Thanks so much for letting me know about the cake mix. My family and I were seriously suprised about how good it was! I loved the light fluffy texture, although I found them difficult to ice because dipping the cake in the fondant icing practically broke the cake pieces apart! I ended up pouring the icing over them, but alas they looked nowhere near as good as yours! ...but they tasted wonderful! 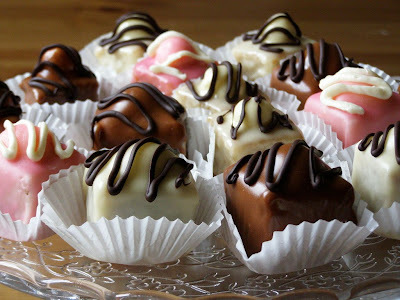 French Fancies used to be one of my favourite sweet treats and having them for the first time in 4 years made me so pleased. Thanks for showing that a vegan version is not only possible, but equally as (if not more!) tasty than Mr. Kipling's! Yay! So glad you liked them Nadia, they are fiddly alright, and you definitely have to spoon the fondant over - some of them I covered 2 or 3 times to get a good finish :-) But, yes - taste good all the same! These are so lovely! Again, you're making me crave a tea party for all these beautiful little treats. Wow, these look amazing! 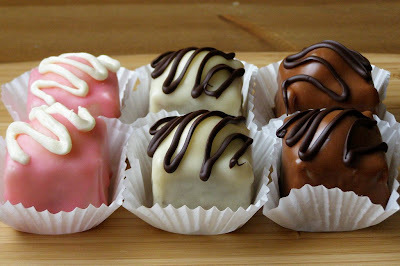 I really miss fondant fancies every so often, although I never bought them as a veggie, but they're something my grandparents had. I used to eat the buttercream blob and pick the icing off, then eat the plain sponge.